Newsgur USA: Will the Golden State film a franchise movie? Will the Golden State film a franchise movie? California does not stop being a rebel in front of the American government. Its great territorial extension, population density, but above all, a high GDP place it in a firm position to face the administration of the country. The Golden State not only has the enactment of sanctuary cities and laws favoring emigrants, but now it also has set another controversial proposal: its division into three territories. Timothy Draper, a capital investor in Silicon Valley, is the promoter of the state division. 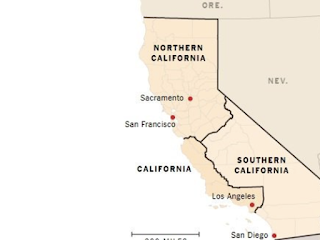 If Draper's dream comes true, the California would be divided into Northern California, Southern California and a central stretch of coast that would retain the name. If voters support the initiative, splitting the state would require several more steps, including congressional approval. However, the authorities have already offered statements on this regard in order to explain the media the complexity of this process. According to the Secretary of State, Alex Padilla, 365,880 valid signatures are required in the petition to be submitted to a vote; a random sampling projected that the petition will obtain more than 110% of the signatures necessary to take the proposal to Congress. If this and other requirements are met, the project may be subjected to vote on November. But the journey will not be so simple; several are the judicial, state and federal obstacles, in addition to the administrative, political and infrastructure ones that the new proposal will have to overcome. Even taxpayers would be severely affected if California is divided into three regions. Since the time of Zorro, (the legend fits in the history of the State) California has shown its separatist intentions. Its natural resources and wide territorial extension have led several politicians and businessmen to think seriously about a separation from the United States, an idea that has been put to a vote, but has never obtained sufficient approval. The Golden State has 168 years of history. Admitted in the Union on September 9, 1850, California has carried out 200 attempts to divide and reconfigure its borders, and become an independent nation. The latest three-part state proposal, developed by a Butte County legislator, failed at the state Capitol in 1993. The proposal aims to invoke Article IV, Section 3 of the US Constitution, the provision that guides how an existing state can be divided into new ones. Timothy Draper's arguments are very clear and to some extent rational. Among the reasons given by Draper there are the territorial extension of California, the population density that is six times bigger than the US average (39 million inhabitants) and, mainly, its economy. California has one of the strongest economies of the nation. In the state, agriculture, energy and the technology sector are flourishing, let’s remember the state is the headquarters of tech giants such as Google, Facebook and Apple, besides the entertainment industry that generates billions of dollars every year and offers multiple employment opportunities. However, its economic opulence has made the state, according to Draper, ungovernable and difficult to administer. Hence, his best idea is the creation of three states that will provide better infrastructure and education and lower taxes. Also, in his divisive campaign, Draper has believes that some regions of California are plunged into poverty and violence due to the government’s neglect. On the other hand, there are several economists, politicians and activists who view Timothy's plan as an irrational proposal that would exacerbate existing problems in several California communities. The economists think that the economic gap between rural regions and those of coastal areas would deepen. They suggest that greater tax revenues would be generated in the coastal zone, since these are the territories of greater economic and commercial profitability. Steven Maviglio, a Democratic political strategist, believes that taxpayers would be forced to pay the transaction costs of the division. According to him, these would reach the billions of dollars, since it would include too the transfer of universities, parks and even retirement systems. Taxes and labor regulations would also be another challenge that should be resolved if the proposal is voted positively. The proposal of this opponent of Draper’s project is to improve the governance of the state and pay real attention to its problems. Far from diminishing the economic and organization gaps of the state, they would be really increased and spread in the new states. The hydra-headed proposal would still hold the same or similar administrative complications. On the other hand, some activists wonder about what will happen to the water supplies that come from a specific region within the State. Would the costs rise for the rest of the neighboring states? What interstate agreement would the authorities establish? And although many analysts and journalists have not delved into it, the immigration issue would be another tricky issue in which politicians will have to work for long hours. While Trump is away from home, fixing problems that do not concern him, California shows its rebelliousness that will surely not end happily.